It has often been said that US monetary policy is data dependent. That’s a fancy way of saying the Federal Reserve governors wait and see what happens to a variety of economic indicators before changing the fed funds rate. For much of the past two years, the focus of this data dependency has been on the US labor market and its implications for inflation. As the pace of economic activity has quickened, investors wanted to know how low the unemployment rate could go without creating troublesome wage inflation. Indeed, the recent stock market correction began in early February when the Labor Department reported that average hourly earnings in January had risen an unexpectedly “high” 2.9% year over year. This sparked concerns that the US economy might be overheating. Stock prices plunged 10% in a few days, before rallying later in the month when it became clear that inflation was likely to only drift higher, not spike higher. Of course, this rally was cut short in mid-March by news that the Trump Administration was imposing tariffs worldwide on steel and aluminum imports. Tariffs and fears of a trade war have replaced the labor market as the worry du jour. As well they should. The US is the world’s largest importer of goods and services. And, believe it or not, we are also the largest exporter of services and the second largest exporter of goods. China, of course, is the largest exporter of goods. According to the World Bank, global trade represents over half of global GDP. We live in a very interdependent world. International trade policy is a serious issue. If mishandled, it could wreck the synchronized global economic expansion that has underpinned global stock markets for the past two years. 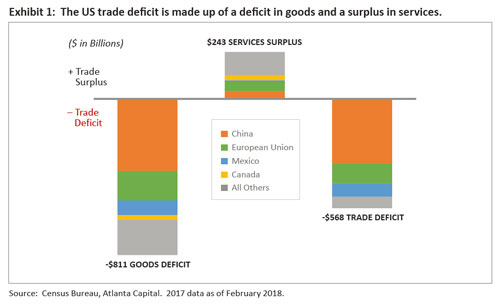 Unfortunately, data regarding international trade — deficits, tariffs, imports, exports, etc. — are more difficult to interpret, less straight forward, more "cloudy," let’s say, than data about employment and wages. For these reasons and their potential for mischief, I call the trade data stormy data. What follows are my views on the key issues facing investors about trade, tariffs and trade wars. What are the trade deficit and its various components? A deficit occurs when a country imports more than it exports. There are two basic components to imports and exports — goods (sometimes called merchandise) and services. (See Exhibit 1.) For the US, we export about $1.6 trillion of goods annually — Boeing aircraft, soybeans, SUVs made at the big BMW plant in South Carolina. We import $2.4 trillion of goods, mostly from China and Europe. Typical US imports include clothing, furniture, autos and household appliances. In 2017 we had a goods trade deficit of $811 billion. This is the number that President Trump likes to focus on, but it’s not the whole story. While the US had a deficit in goods, we had a surplus in services. We are the world’s leader in exporting services like insurance, financial services, travel and education (think foreign students getting their PhDs at American universities.) Last year the US had a trade surplus in services of $243 billion. Combine the deficit in goods with the surplus in services and you get an overall US trade deficit of $568 billion. This deficit represented 3% of our $19.5 trillion economy. Are trade deficits harmful to the economy? Most economists believe, as I do, that a trade deficit (or surplus for that matter) is not necessarily bad or good for an economy. Simply put, a country that consumes more than it produces must import, or borrow from another country to make up the difference. This creates a trade deficit. Conversely, a country that produces more than it consumes must export, or lend the excess to another country. This creates a trade surplus. Trade policy usually plays only a minor role in determining the trade balance. In the case of the US, we routinely consume more than we produce, i.e., we save very little, borrow a lot and run large federal budget deficits. Because of this, we must import goods and services to make up the difference. There is little evidence that trade deficits have been harmful. In fact, quite the opposite. Exhibit 2 shows the 50-year trend in the US trade deficit as a percent of GDP. 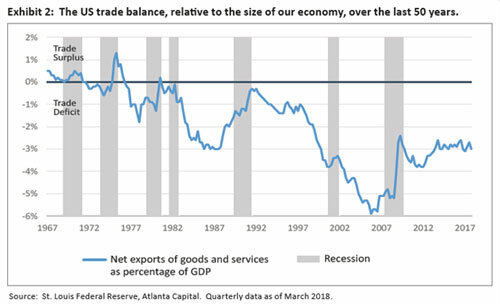 Note the trade deficit tends to improve during recessions and deteriorate during expansions. If deficits were harmful, this wouldn’t be the case. As the world’s largest economy and biggest importer, when the US is healthy and growing, like now, our trade deficit naturally expands, because American consumers are in a buying mood. Are foreign competition and unfair trade practices responsible for the decline in US manufacturing? Both of these factors are often cited. But let’s not forget the domestic factors. Until last year, the US had one of the highest corporate tax rates in the world. US regulatory and environmental standards are high, particularly compared to those of China. That said, I believe that the alleged decline of US manufacturing is exaggerated. Factory jobs as a share of our labor force have declined over the past 50 years. But, factory output as a share of our economy has remained relatively steady at about 12% of GDP. What’s going on? Through technological innovation, American manufacturing has been incredibly adaptive to increasingly competitive world business conditions. Yes, good factory jobs have been lost, but manufacturing’s importance in our economy has changed very little. Competition, both foreign and domestic, has caused the decline of many individual companies and industries. Cheap labor in China, Vietnam and Bangladesh decimated the textile industry in the American South during the 70s and 80s. But the offspring of many of those textile workers now build BMWs for $30 per hour at the plant in South Carolina. Now bankrupt Bethlehem Steel was once the nation’s second largest steel producer and is often cited as a victim of foreign competition. But I suspect the main culprit was the American company Nucor, which perfected the mini-mill technology of steel making. It is now America’s dominant steel maker. America’s factories are still making lots of stuff, just doing it with fewer workers. Will tariffs help solve our trade problems? It’s unlikely. A tariff is a tax or duty on a particular class of imports or exports. Most foreign countries impose higher tariffs on US goods than we impose on foreign goods. That may seem unfair, but it is one of the reasons Americans enjoy much higher living standards than other countries. Not only do we produce a higher GDP per capita than the rest of the world, but we tax personal incomes as well as imports at lower rates. As a tool of trade policy, tariffs are often imposed on goods that a country is accused of selling (dumping) at unprofitably low prices. China dumps steel and aluminum on world markets because they have over-invested in these industries and are seeking to maintain employment to prevent social unrest. While American consumers in the aggregate benefit from low steel and aluminum prices, tens of thousands of steel and aluminum workers do not. And for national security reasons, the US has an interest in maintaining a viable steel and aluminum industry. But, in dealing with trade issues, there are three problems with tariffs which limit their effectiveness: they are inflationary, they invite retaliation, and because of the first two, they reduce economic activity. There’s one more aspect of the trade situation that warrants discussion. I believe much of the data on imports and exports are at best imprecise. As a result, I doubt the US trade deficit is as bad as the doomsayers portray. Collection methods for international trade data were developed decades ago, before the development of intricate global supply chains. What’s more, multinational corporations have become increasingly adept at “profit-shifting” around the globe to maximize their tax advantages. All this has tended to distort the trade data. An example will help clarify. Ireland has a trade surplus of 22% of its GDP, while its close neighbor the United Kingdom has a deficit of about 4%. Why the big difference? Ireland isn’t usually viewed as a manufacturing export powerhouse. The difference is probably related to Ireland’s super-low corporate tax rate of 12.5%, which provides multinational companies, like Apple, a powerful incentive to locate “operations,” particularly intellectual property, in Ireland. This tends to inflate Irish exports at the expense of US exports. Indeed, Apple cites Ireland as one reason its tax rate in 2017 was only 18% versus the then US corporate rate of 35%. As most people know, much of the value of the Apple iPhone is in its design and engineering done in the US. Many key components are made in Taiwan, South Korea, and Japan. Yet the final assembly is done in China and most of the import cost of the iPhone is assigned to China. This tends to inflate Chinese exports at the expense of US exports. My point is simple: US exports are understated and the trade deficit overstated due to trade accounting rules and corporate “profit-shifting.” By how much? No one will ever know. In my view, the US trade deficit is a minor problem in search of a disastrous solution. The US economy is currently performing well, despite its $568 billion (or whatever the number is) trade deficit. Last year’s tax cuts and the administration’s continuing efforts to curb burdensome regulations should further improve the competitiveness of US exports. But the administration’s current trade policy with its emphasis on tariffs is a risky gamble. It holds the potential to raise inflation, raise interest rates and slow economic activity—not good for either the stock or bond markets. While China has committed numerous trade violations, it also supplies us with inexpensive consumer goods, is a vital part of many US companies’ global supply chains and is our third largest export market behind Canada and Mexico. If the administration’s emphasis on tariffs is a negotiating strategy, and not the beginning of a trade war, the sooner we find out, the better. In the meantime, stormy data will continue to cloud both the economic and market horizons.